A one-day introductory workshop using clay, plaster and alginate. This course is great for anyone who wishes to explore negative and positive forms. Teachers might find it particularly beneficial as it will cover accessible basic techniques. The course is also open to young people above the age of fourteen. Marion has a wide range of experience running workshops, managing sculpture facilities, working in galleries and teaching in art schools. She has several commissions that are sited locally at Loch Leven, Dundee and Anstruther. She was elected Secretary of the Royal Scottish Academy of Art and Architecture in 2012. Two approaches will be covered. 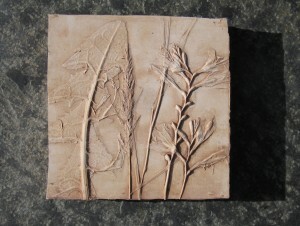 First the elementary – pressing shells, rope, lace and leaves into a slab of soft clay, then making the impressions permanent by casting them in plaster of Paris. The second method is to cast from real objects. Appropriate objects will be provided, or you can bring something of your own and if it’s suitable cast it. As well as learning these basic techniques, you will find out how to use alginate, the mould-making material. This is derived from seaweed and is used in the dental industry. To find out more, book a place on the course.